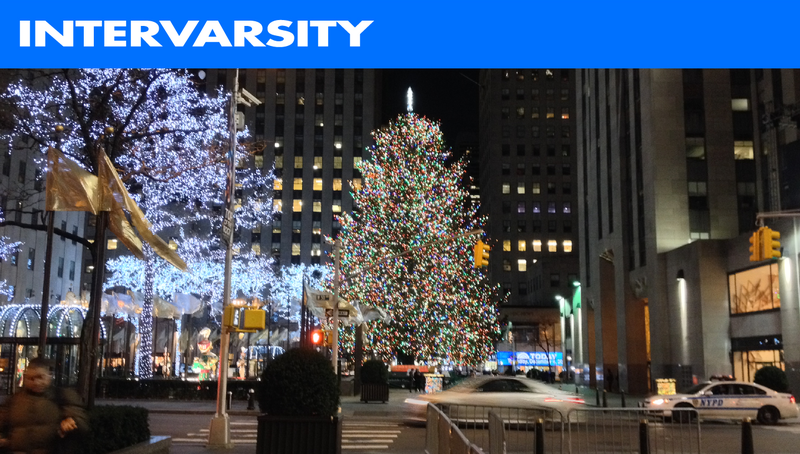 InterVarsity & Advent at NYU: Act now to help us meet our Christmas matching grant! We have been so blessed this semester: Our community has grown, our callings have been clarified, and our lights have shined. God is so good! Help us to finish 2014 strong by contributing toward our year-end matching grant campaign, ending December 31st! Please donate now to make twice the difference this Christmas! Thank you so much for your continued prayers and support for my ministry to the graduate and professional students at NYU. Christ has met us in powerful ways this semester as week-by-week we have gathered to renew our commitment to follow and serve Him in the academy and in the professions. It is such an honor to minister to these students as they prepare for their various vocations. 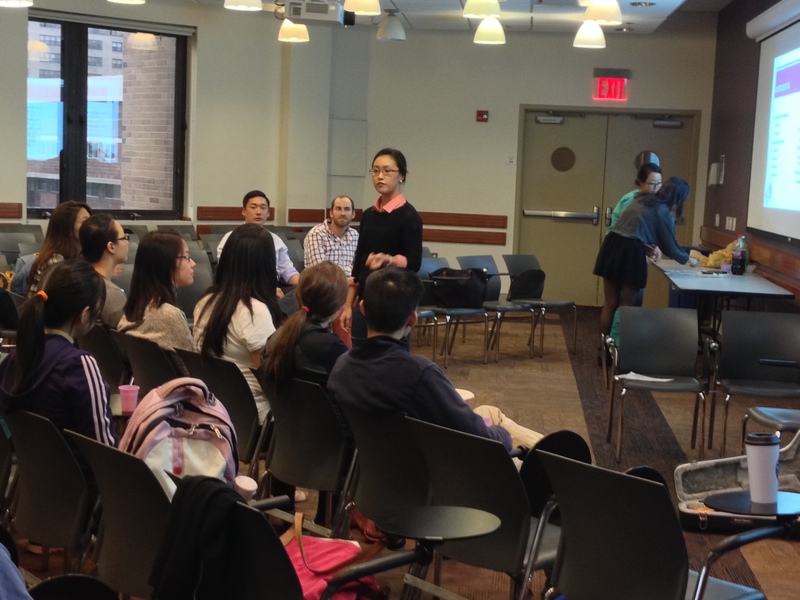 The Christian Medical & Dental Associations at NYU have grown, developing Bible studies that challenge med and dental students to use their gifts for the common good by practically loving their neighbors through health and dental care. In the spring many of these students will take to the streets to help serve New York’s homeless population with the #Don’tWalkBy campaign. The Christian Legal Fellowship has also grown this fall, welcoming new law students from all around the world into our community. Week by week about thirty five law students gather in this fellowship to explore how God is calling them to serve in the legal academy and through legal practice. 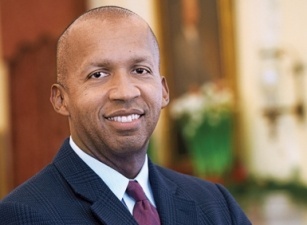 Last week the Christian Legal Fellowship hosted Bryan Stevenson, the founder and Executive Director of the Equal Justice Initiative, a private, non-profit organization headquartered in Montgomery, Alabama, a professor here at New York University School of Law, and the author of Just Mercy: A Story of Justice. (See his TED Talk here). Professor Stevenson spoke to the CLF the day after the Grand Jury decision in the Eric Garner case was handed down. At that crucial moment, he shared how the gospel gives him hope in even the most troubled of times, and how his Christian faith has shaped his sense of vocation, his commitment to justice, and the course of his career. He issued a powerful call for our students to use their gifts, talents, opportunities, and legal educations “to do justice, to love mercy, and walk humbly with [our] God.” It was an incredible, clarifying moment for many of the students in our fellowship. Professor Bryan Stevenson, author of Just Mercy: A Story of Justice & Mercy , addresses the Christian Legal Fellowship at NYU, challenging us to lead lives of service and to pursue reconciliation, social justice and the common good. Our graduate student ministry has grown spiritually and numerically, nearly tripling in size, over the course of the semester. As our ministry to grad students has grown, so, too, have our opportunities to serve the campus. Late last spring I met Joe and Bianca, a wonderful young couple, both pursuing PhDs in neuroscience here at NYU. Joe, a recent convert from atheism to Christianity, and Bianca, a long-time Christian, both wanted to explore what it means for them to faithfully follow Jesus while working in the challenging world of the natural sciences, and so they joined the Graduate Christian Fellowship here at NYU. 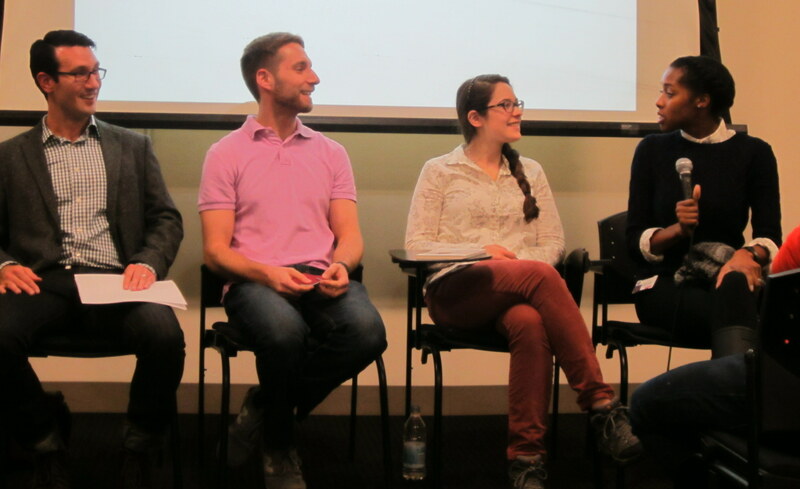 In October Joe and Bianca joined me and Jacquelyne, another Christian student pursuing a PhD in the sciences, in speaking to a packed undergrad audience about the compatibility of Christian faith and modern science. These future scientists are preparing for a lifetime of witnessing to God’s sovereignty over all things and of influencing young minds. To all of my current supporters, thank you for making this ministry possible. Through your generosity God is graciously enabling us to make a difference in the futures of these students and of our world. I thank God for you daily. You can make a big difference this Christmas in helping us to transform the lives of tomorrow’s leaders! We still need to raise $20,000 of our overall budget for this 2014-2015 fiscal year, ending June 30th. Will you help us finish 2014 strong by making a year-end gift or by becoming a monthly donor? Every dollar donated supports my work and is greatly appreciated. Thank you so much for your prayers and support! Alissa and I celebrating a great year at the Nomi Network Christmas party. Alissa is the co-founder and Vice President of this innovative social enterprise that is working on the front lines of the fight against human trafficking. Click here to learn more about the Nomi Network and about how you can help free women from modern day slavery. Alissa and I celebrated our first wedding anniversary this past Monday. 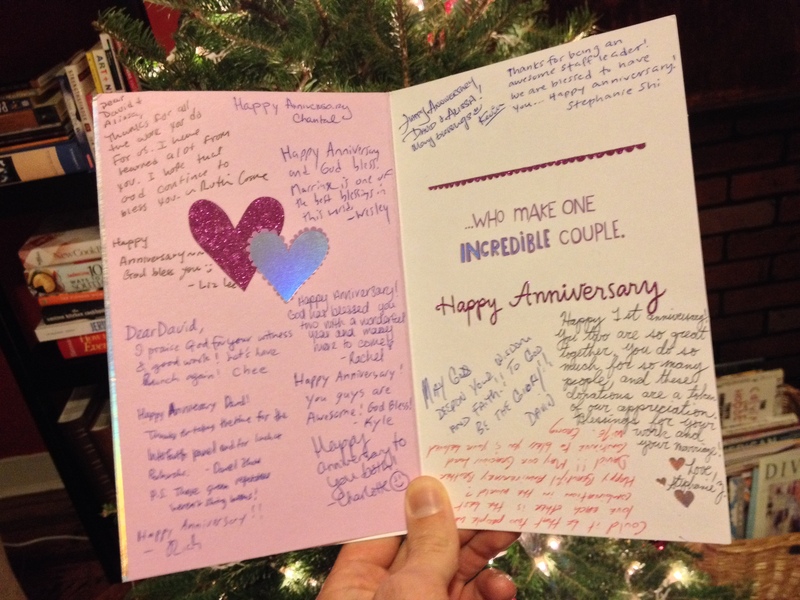 We were very touched to receive this card from some of the students in the Graduate Christian Fellowship at NYU along with checks for both InterVarsity and the Nomi Network. All in all, NYU students have contributed nearly $2,500 towards this ministry. Praise God! 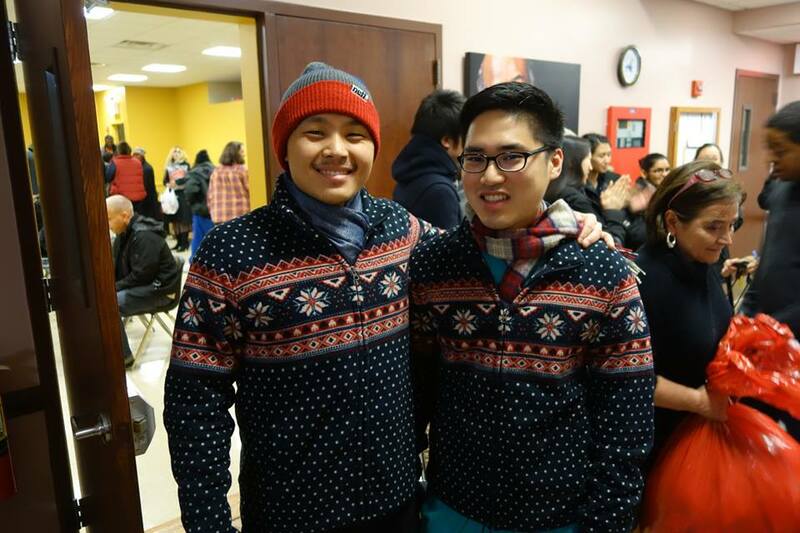 James and Joe, two first year NYU dental students and members of the Christian Medical & Dental Associations here are getting into the Christmas spirit! I am so grateful for the opportunity to serve this great group of enthusiastic new students. Please pray for them and for all of my students as they take their finals this week! That God would supply the financial needs of our ministry. That God would bless the efforts of the four graduate and professional student fellowships here at NYU. That God would lead me to people who would be willing to serve our students as mentors in their various fields after they leave NYU. That God would lead me to additional ministry partners in New York City. Posted in UncategorizedTagged Campus, InterVarsity, NYUBookmark the permalink.